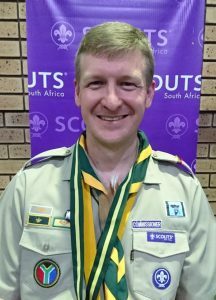 Kimberley – On the 7th of October 2017 the new Chief Scout of the South African Scouting Movement, Dr Brendon Hausberger, was inaugurated. As the Chief Scout Dr Hausberger is responsible to work with the team of Scouting volunteers to inspire and empower over 190 000 youthful members to be good leaders and community minded, environmentally conscious pro-active citizens. 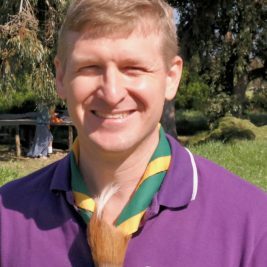 Dr Hausberger was previously the Chief Commissioner of SCOUTS South Africa (SSA) and served on the SSA Executive Committee. He has been an active and dedicated adult member for over 20 years, during which time he has worked with the youth to empower many children and youth through Scouting activities and events and has worked with the training and development of our adult volunteers as a member of the adult leader training team. As the Gauteng Provincial Commissioner, with the support of the regional team and Scouters in Gauteng, he oversaw the implementation of the Scouting programme, a number of environmental and sustainable community upliftment projects and managed the regional infrastructure. When not at Scouting, he carries the pursuit of leadership and environmental awareness into his work environment. He is the CEO of Holland and Hausberger, a South African engineering firm with a particular focus on providing energy and fuel needs through renewable and energy efficient applications. SSA is aligned with the objectives of the National Development Plan 2030, working with its members and partner NGO’s to grow the youth to be a proactive part of tackling the many challenges facing South Africa as a nation. By providing the youth with valuable life skills, vocational training, leadership and conflict management training, partnered with a programme designed to provide them with invaluable self-esteem, respect for differences, Scouting is working to make South Africa a better place for all. SCOUTS South Africa is an independent, non-profit educational movement dedicated to the development of young people in achieving their full potential as individuals and responsible citizens. Central in this programme is a continuous transference of values such as honesty, loyalty, responsibility, respect; all aimed at teaching the youth to moderate their own individual behaviour and enabling the development of strong leadership skills that will equip these members to be of service to others and to their communities. With a membership of 190 000 members nationwide, of which most live in previously disadvantaged and impoverished areas, we are a Movement on the go, preparing a generation of leaders and innovators. SSA is a member of the World Organisation of Scout Movements, WOSM. The Scout Movement was founded in 1907 by Baden Powell based on his experiences in South Africa at Mahikeng. It has over 42 million members in over 200 countries and territories.